Pena will miss 10-to-15 days with an oblique injury, Derrick Goold of the St. Louis Post-Dispatch reports. Pena suffered the injury during Tuesday's game against the Phillies. 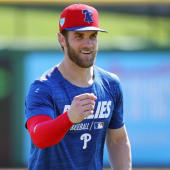 A two-week return timeline would still give him a bit of time to get ready for Opening Day, though his chances of breaking camp with the big-league team were reduced when the club signed Matt Wieters in late February.